Cooking with fresh herbs is a true pleasure. A signature of my cooking is a bunch of fresh thyme just clipped from the bush tossed into the pan. The price of fresh herbs is enough to choke you sometimes. When you consider most of the fresh herbage you just purchased will be tossed due to spoilage; dried herbs seem quite attractive. Especially to the occasional cook, why waste the money? There are several herbs out there that actually thrive on neglect. Trust me on the statement in that I have given these the test and they survived. They are wonderful and robust specimens. Recently I learned why. I’ll share that with you later in this article. If you are new to herb growing, begin with the basics. Perennials are highly recommended. They winter well here in the North Carolina climate. You will need to consult a gardening map to determine what zone you are in for successful gardening. Face it folks, if you have hard winters, bring your plants inside. They are living things after all. Most of the plants I write about are ones that I have had personal experience growing. You are encouraged to comment on your own successes and make recommendations based upon where you live and what you grow. While I am not a master gardener by any means, I enjoy playing with plants and dirt and watching what happens. This year I decided to plant radishes. 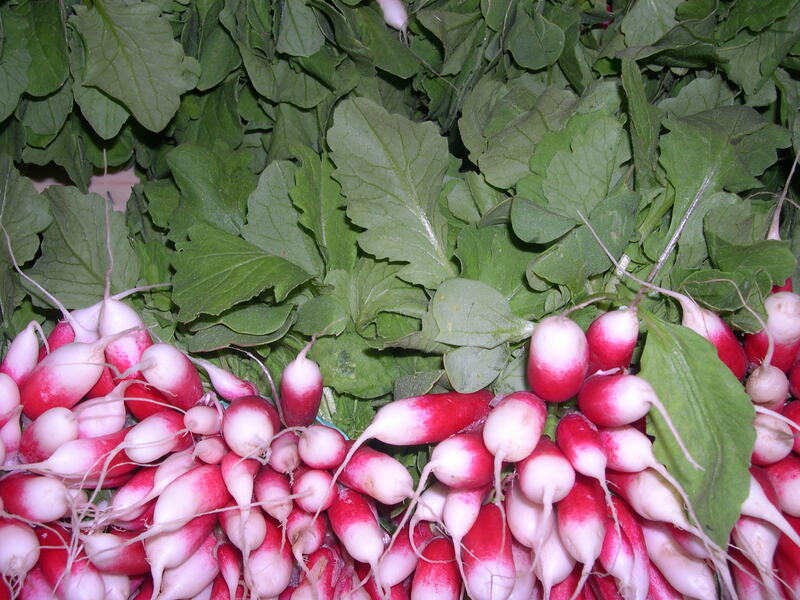 I love radishes of all kinds. Rinsed, dipped in Fleur de Sal, crunch! The complexity of salt, heat, crisp, watery, refreshing, earthy flavors wash over your taste buds in several intense bites. I love radishes. I tried to grow radishes. It was not a very pretty or successful project. They turned out long and woody, either real intense raw heat or none at all. They were quite like nibbling on bits of woody spicy rope. Being extremely disappointed, I pulled them all up, replaced the soil and started again. This time I planted beans; green beans. My dad said they would grow. They did. I won’t grow them again. Here’s what I do grow, rather it grows for me. I leave these herbs out all winter. They are planted in large pots, 1 herb to a pot. 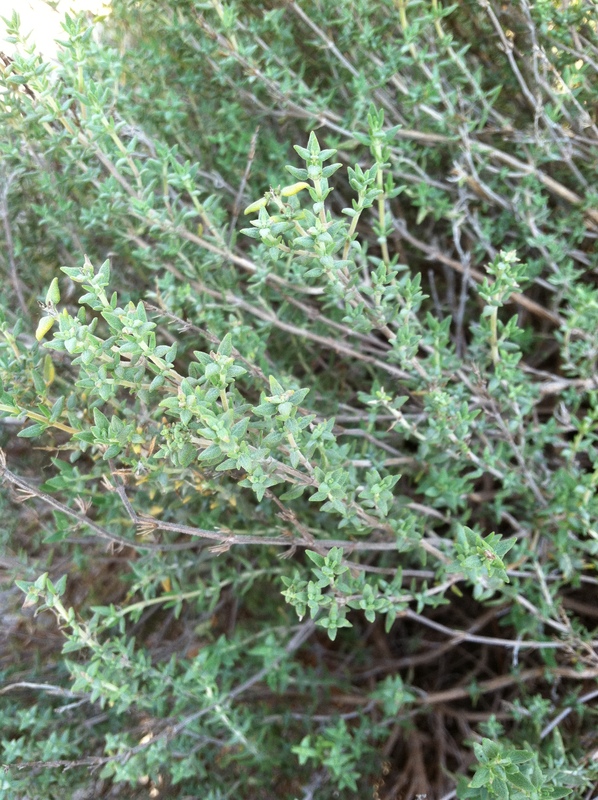 Thyme:my signature herb. Only fresh will do. It likes to trail over the edge of the pot. Chives: Onion and Garlic (flat leaves) If you have extreme winters, bring them in. It is amazing to see the new shoots come back up after a cold winter. The flowers are as useful as the leaves. Marjoram: Currently I have a pot of variegated marjoram which I love. Flat leaf Parsley and curly parsley: These are quite nice when mixed with pansies in the same pot. Pansies: Nice colorful cool weather plant that holds up until the heat sets in. 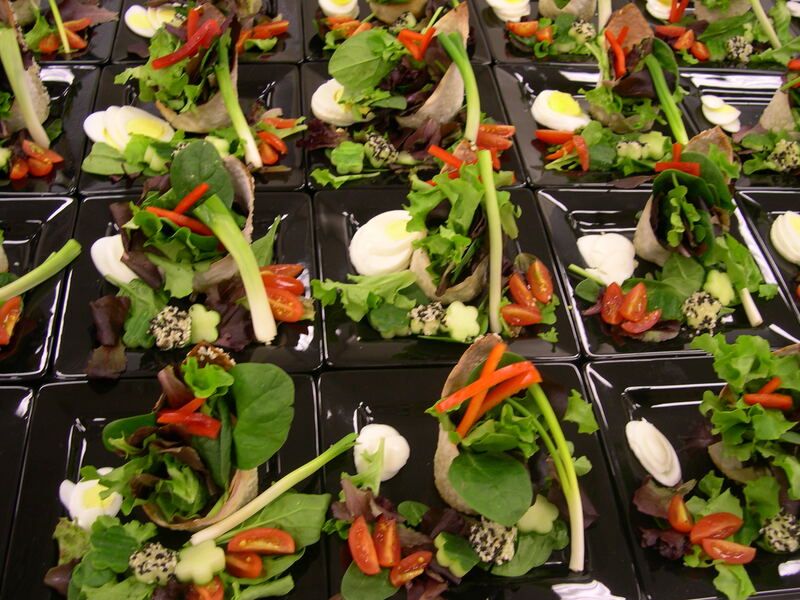 Use the flowers in salads or as garnishes. They can even stand being frozen and still be vibrant when it warms even slightly. Rosemary: This is an herb that loves to be neglected. If it forms woody stalks, cut them and use them for smoking in your grill. Plant it against a wall or in a corner so it can take over. Plant it next to a walkway so it can be brushed against to release its amazing aroma. Plan plenty of room as rosemary can spread. Large woody rosemary stems can be used for kebobs for meats and vegetables; dried woody stems can also be used for smoking. Lavender: This is a well-loved herb. 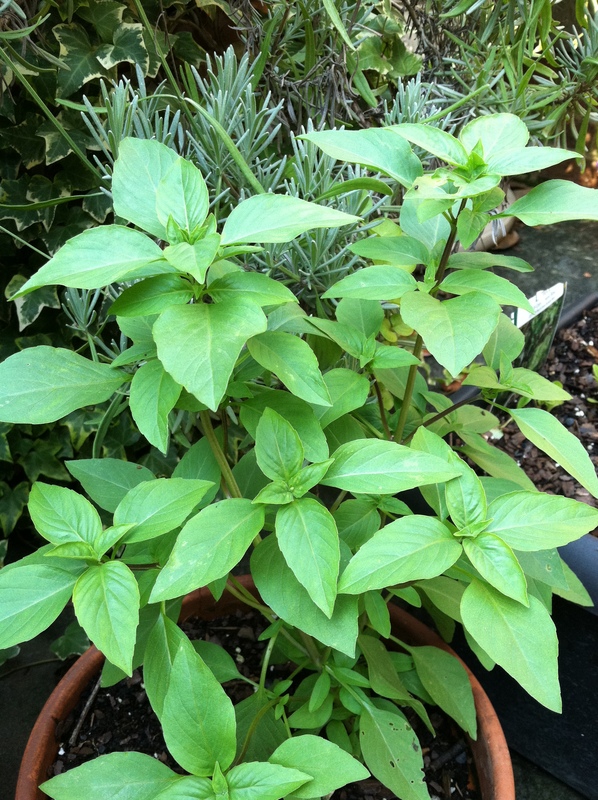 Mediterranean inspired; this is a wonderful highly aromatic herb. Replace rosemary in your recipes with lavender for a real taste treat! Use stalks for kebobs of lamb, pork, or chicken. Use dried limbs of mature lavender to smoke in your grill; use flowers as garnish in desserts or potpourri. Although you can’t make essential oils at home without great effort, having lavender essential oil on hand has first aid benefits. It soothes burns and helps healing without scaring. The scent of Lavender is very soothing to the mind and nerves. Mint: garnish desserts, top summer drinks, muddle for a Mojito, puree into a pesto, boil with vinegar, steep for tea, the uses for a mint plant are endless. “But it takes over!” yes, if planted and not trimmed, it will grow wild. I grow mine in a pot. I used to love walking through my mint patch at my mountain house. Mint comes in many varieties and is easy to root most of the time. Share cuttings with other gardeners to expand the varieties you grow. Some varieties include: Chocolate mint, pineapple mint, apple mint, orange mint, spearmint, “Kentucky Derby” mint (the Mint Julep mint) just to get you going. I try to root cuttings with “Rootone” rooting compound powder. Dip a freshly trimmed mint stalk into the compound and plant in soil. Keep out of direct sunlight and well watered until the plant shows signs of growth or dies. Either way, you know what to do next. Tarragon: My all-time favorite flavor. Fresh tarragon is not the same as dried tarragon, no way, no how. What fresh tarragon can do to any egg dish is pure magic. The plant may die back in the winter, but so far, I have been lucky in that it always comes back in the first warmth of the spring and grows to provide more than we can use until frost. If you are not familiar with tarragon, get acquainted. Some folks say it tastes similar to licorice but actually the flavor profile is much more complex. 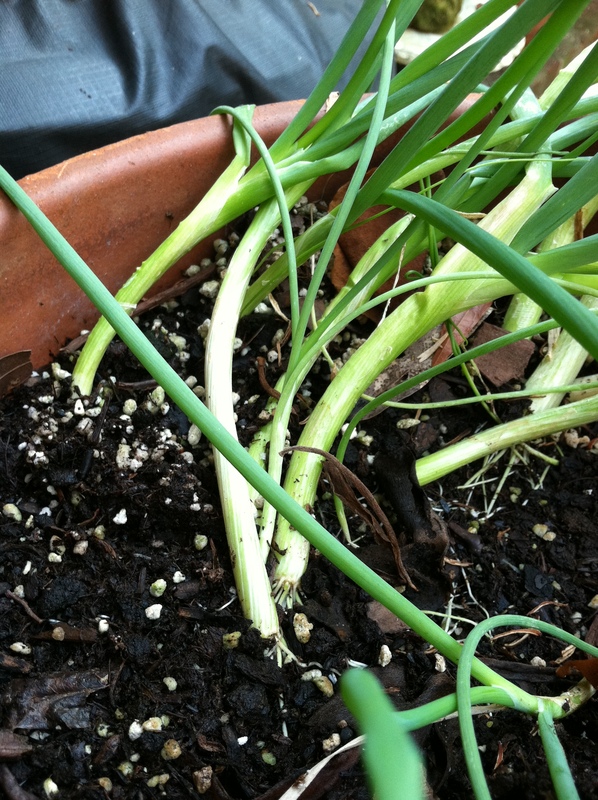 Scallions: Slow growers, like to be crowded so they help hold each other up. I like picking scallions seconds before they get dipped in Fleur de Sal and eaten. Garlic: A three year process from new clove to decent garlic bulb production but interesting and fun in the meantime. Fresh garlic is mild and really food for your health. Onions: if any onions sprout in the cabinet while being stored, I plant them. The greens have a great appearance. I find it hard not to dig them up multiple times just to see what’s going on with the bulb under the soil. The flower stalks, as with garlic, should be allowed to bloom and then cut so the energy goes into the bulb production rather than flower production. The flowers can be sprinkled over vegetables, grains, potatoes, pizza, grits; they have a mild onion or garlic flavor and area quite attractive and unusual. There you have it, what I grow in a nutshell. None of these things are hard to grow. They seem to take care of themselves and are quite forgiving when neglected. They actually prefer it. 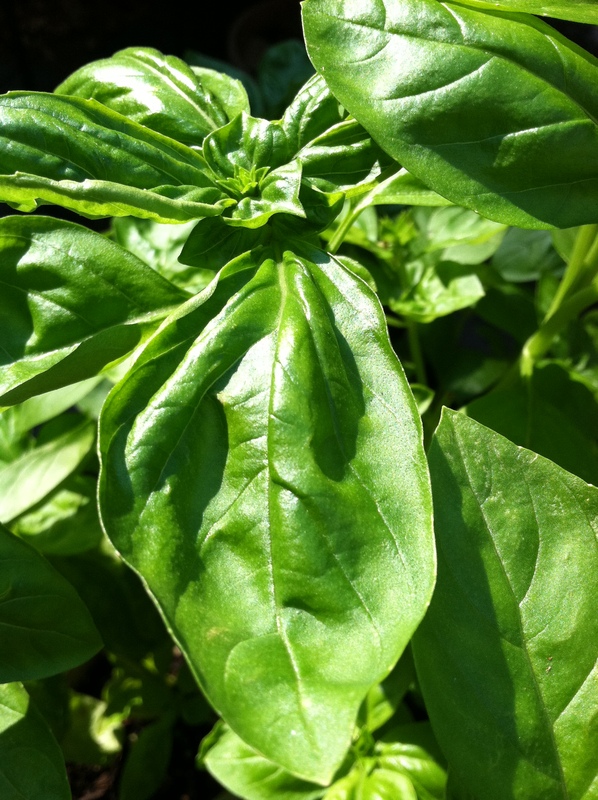 Basil– sweet, cinnamon, opal; all these are varieties of basil. Branch out and discover a new variety. Cuttings root easily to double the plants in your garden. When they show signs of beginning to flower, cut the plan in half and place it into water. In about a week or so, it will root and then replant in the garden. Pinch the flower buds back when you first cut the plant. Cilantro– early and late in the season, it bolts to seed quickly in any kind of heat. Sweet 100’s small tomatoes and container variety tomatoes: not very successfully, but I try every year. Jalapeno peppers– not sure why, I don’t eat them. They get pickled and by next summer they are gone so someone eats them. Leave them on the plant longer for red ones. And whatever else catches my eye while selecting my herbs. Consult gardening websites for specifics on growing herbs. Some garden designs can be quite elaborate. I grow what I use in pots and various containers since I do not have a decent plot of land to cultivate an herb garden. One trick I promised you earlier regarding full flavored and robust herbs: for the most part let them be. Don’t over water them. If you do, the flavors and essential oils won’t fully develop. Be sure to feed them too! Do not allow any insecticide to be sprayed around the herbs you eat. Some have natural insect repellent qualities like Mosquito plant aka citronella. Share your herbs with neighbors. Cut several bunches, tie them with a ribbon and give them to a hostess when invited to dinner or friends homes. Unless I’m rooting an herb, I leave it grow and only cut what is needed. If you buy them fresh, store them with the stems in water in the refrigerator, if there is room. You are encouraged to grow your own herbs. Your cooking will be elevated, your family and friends will LOVE the flavors and aromas. You will feel great knowing you are a better cook and saving money at the same time.